Generally by the end of a school term I am exhausted and very ready for some quality time with the kids. As much as I love the idea of just chilling at home, as a family we’re not very good at that. The kids argue or get bored and I just have to get out of the house at least once a day. We’re much better off being busy, so I try and organise a mixture of days at home with not much planned, days at home with friends over, day trips out and once a year we have a holiday. Kidzania in London is always a great day out. We’ve been a few times now, but there’s always something new or different to try. We especially enjoyed the Halloween special event last year. If you have children over 8 you can check them in and leave them to explore while you shop. There’s also a quiet coffee area where you can relax or work while the kids have fun. While you’re in London why not finish the day with a guided bus tour too? Another of our favourite day trips is a visit to a National Trust site. Cliveden is one of our local favourites. We usually buy an annual family ticket so we can visit as many times as we want throughout the year. It works out great value for money, especially for a family as big as ours. I am very much looking forward to a visit to the Warner Brother’s Studio Tour later this year. I can’t believe we STILL haven’t been as we are all such huge Harry Potter fans. 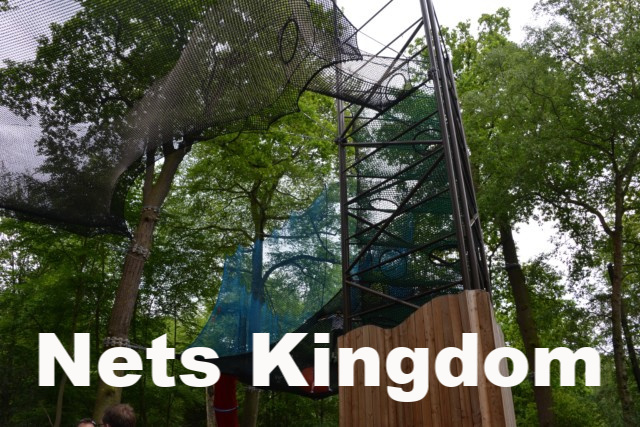 Nets Kingdom or GoApe are always a fantastic few hours too. Nets Kingdom is brilliant fun for two hours, my three 3 bigs LOVE it! There are huge nets strung between trees with slides down and tree houses and kids get to clamber around, SO much fun for everyone and great exercise too. If you have kids who like theme parks we love Paulton’s Park as it has plenty to keep my bigger children happy and also Peppa Pig World for Charlie. Zak ( age 12 ) is a huge fan of Thorpe Park as he’s a bit of a rollercoaster junkie, and the girls really like Legoland. For a bit of luxury outside the UK I can’t recommend Mark Warner enough, their childcare is second to none. We’d go back every year if we could. We’ve visited Levante Beach many times now and it just gets better and better. If you’re looking for more unusual break, camping is always a fantastic option, and it’s not just about tents and campfires anymore. We’ve visited some amazing campsites over the years in Europe that the kids just love. You can camp by the sea, in the grounds of castles, in the mountains…the opportunities are almost endless. One of the things I am determined to do either this year or next is stay in a tree house. Cool Camping have some amazing options available. I’m going to spend some time looking later to make my dream come true! I have also just spotted a UFO style dome, that I could definitely be swayed by! Do you have any unusual days out or holidays planned this year? I’ve heard some great things about the Harry Potter tour at Warner Bros, so I can’t wait to see your post on what you get up to when you visit! Olivia jade recently posted..Lea Marston Hotel Review 2019.